This track is one of the more interesting tracks in the pigeon house mountain region in the yadboro state forest which is part of the milton to nelligen trek. the tracks leading to this trail are reasonably maintained dirt roads that any car could make. Cattlemans trail branches off the western distributor road and can be a bit hard to spot the start, but have noticed smaller yellow signs for the trail. 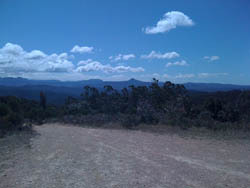 the smaller track is very enjoyable with 2 decent descents and a small creek crossing and leads to mogood look out. We had a navara (4x4) and a subaru forester (soft roader) and both made the track just fine but would be very hard in wet conditions.